Hooray ! 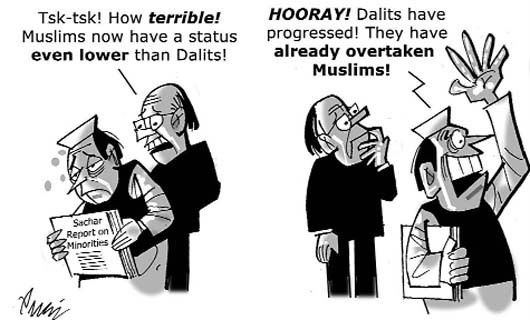 Dalits have progressed ! Update: Though this post is labelled under ‘Humour’, let it not distract the very serious issue at hand. Based on the data leaked so far, it is evident there are entry barriers Muslims — who account for 17 per cent of India’s population — are unable to cross in virtually all walks of life. From the administration and the police to the judiciary and the private sector, the invisible hands of prejudice, economic and educational inequality seem to have frozen the `quota’ for Muslims at three to five per cent. Thanks to a hysterical campaign run by the Bharatiya Janata Party and some media houses, the Sachar committee was denied data on the presence of Muslims in the armed forces. But even there it is apparent that the three per cent formula applies. This bleak statistical picture is rendered drearier still by new trends visible in many cities. Muslims, for example, find it extremely difficult to rent and buy property outside of “Muslim areas” in some metros. Thanks to Krish for the link to Siddharta Varadrajan’s article. Interesting cartoon. I remember Ram Vilas Paswan had once asked a senior Muslims leader that how could Muslims in just 50 years fell behind even Dalits who had suffered for thousands for years to reach the bottom. I agree that the worst situation is Muslims not allowed to buy a house outside ‘their locality’. I wonder if anyone answered Psawan’s question. It is a very pertinent one. UCLA) professor Alexander Saxton. Saxton talked about how lower class (proletariat, lupemproletariat, etc.) whites vied for power and would exploit their fellow Black and Chinese workers despite the fact that they were in the same boat. Irish workers for example were considered to not be white and were near the same level as Blacks for many years, and yet instead of teaming up with their fellow Black workers, once they got the chance to “make it” and “move up the food chain” they would rejoice in the fact that they had passed up Black people in societies eyes. Despite the fact that lower class whites were thoroughly exploited in America there was still this power dynamic and a vying of “control” in these communities. Quite an interesting phenomenon, Saxton stated that the lower class whites (Irish, Italians, Eastern Europeans) played into the hands of the white capitalist class by always fighting each other and not unifying. This was the case in Hawaii as well during the 1920s until World War II with Pilipinos, Japanese, and Mexicans fighting each other despite the fact that they were all being exploited by the landed class of sugar plantation owners, and every time they would try to form multi-ethnic unions they would self destruct due to internal feuding and outside pressure. Yet, during the mid to late 1940s these plantation workers were actually able to form a cohesive union that was unified on all fronts and because of this they were able to succeed widely in all their demands and their endorsed candidates practically swept the state legislature. 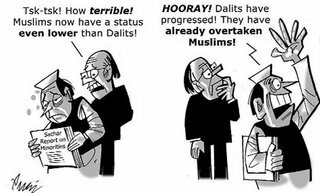 This cartoon brings up a lot of issues and I find these issues to be very interesting because of the parallels with the Dalit Hindu dynamic and the Muslim dynamic with the American white worker dynamic with the Black and Chinese worker dynamic. This cartoon and the illustrations from 19th century America shows what happens when people don’t transcend petty differences created and exploited by the privileged classes in society and in reverse, 1940s Hawaii sugar plantations show us the power of what can happen when the non-privileged classes unite. Very good post, especially with the commentary on Muslims in India and there exploitation as well. Thanks for a very insightful comment, Jack. And for having added so much to the picture. Indeed, the question of identity is a very dicey one- while it unites the working people beyond a point it more often than not tends to divide. We are all walking down a treacherous road of enforcing proportional representation in under represented areas, while ignoring the over representation. A case in point: Across southern TN and Kerala, Muslims are the wealthiest groups in the countryside due to easy access to gulf employment. Surely that is not a minor advantage over the Dalits, considering that gulf money is driving the economy of an entire state and many districts of another. RC: a very perceptive point. There is a world of difference between North and South India (and in another sense between the peripheral India and central or Hindi speaking areas). And this is also reflected in the status of Muslims. Making a blanket statement is erroneous. This is specially so as most North Indian commentators do not care to factor in the dynamics in South India. On the other hand, as far as Muslims are concerned, the 2001 census figures indicates that the top 5 states with Muslim population are UP, W Bengal, Bihar, Maharashtra and Assam. 60% of India’s Muslims live in these 5 states while the four Southern states (AP,TN, Kerala, Karnataka) together make up less than 18% of the Muslim population in the country- of which Kerala Muslims are 5.65. In other words, 82% of India’s Muslim population lives outside the southern states. Therefore, while it is incorrect to generalize for Muslims as a whole, the 82% population outside Southern states makes a case for the overall perception. Regarding reservations- it is a tool, it can be a means for facilitating social change and has its limitations. There are shades of gray, that have been lost in the rather trite Yes/ No poser on reservations. That aspect requires a separate treatment and another post altogether.